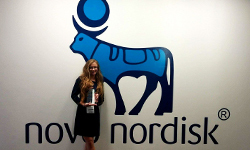 Erin Gorse beat out hundreds of individuals from across the country just to compete in "Innovation In Action," a competition sponsored by Novo Nordisk, a Danish pharmaceutical company. This was the first year Novo Nordisk held the competition in the United States after several successful years in Europe. Now, after winning the competition, the Duquesne University School of Pharmacy PY2 is packing her bags for Denmark. Gorse met her team, which included graduate students from North Carolina State and New York University, a USAID scholar from Egypt studying at Farleigh Dickinson University and a Ph.D. candidate from Notre Dame, only a day before presenting the to the U.S. executives of Novo Nordisk. The competition asked participants to develop strategies-legal, economic, environmental and social-to better manage diabetes for individuals in Shanghai, China. Facing competition from teams of graduate students and Ph.D. candidates from colleges and universities across the country, including Brigham Young University, Columbia University and the Massachusetts Institute of Technology, Gorse and her multi-disciplinary team won the competition and a trip to Denmark to visit the Novo Nordisk international headquarters and compete against the European champions. Gorse leaves for Denmark on Nov. 14 and will compete in the international final on Nov. 17. The group will also spend time touring the Novo Nordisk facilities and meeting with employees and executives. Congratulations Erin and good luck in Denmark!